Why do people do what they do – both personally and professionally? I’ve always had a mild fascination with this topic. Winemakers tend to be very passionate people. I thoroughly take pleasure in asking them why they do what they do. Inevitably, they are doing what they love and therefore, are very happy people. Recently at the Sonoma County event in New York, I enjoyed some brilliant wines, but my favorite part of the evening was hearing how some of these winemakers turned their dreams into reality. In the seventies, Joel was “educated as a clinical laboratory scientist with a degree in microbiology.” He worked “full-time in cancer immunology research at a San Francisco hospital while dabbling in wine on the side.” In the Peterson family, the apple didn’t fall too far from the tree. Joel’s mom, a nuclear chemist who worked on the Manhattan Project, helped Alice Waters to edit her first book. 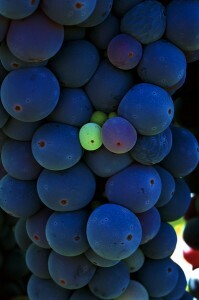 His dad had a passion for wine, frequently organizing wine gatherings at his family’s home. Joel’s first wine education began at the tender age of 10 at one of his father’s tastings when he was told to “shut up and spit.” Of course his dad watched closely to make sure Joel did in fact spit. Joel stopped the dabbling and took his passion full throttle. He and his business partner Reed Foster founded Ravenswood in 1976. I was able to spend some time with Damaris Calhoun, whose grandmother, Damaris Deere Ford started up this winery after visiting the region on a trip post her divorce in the seventies. (Ms. Ford remarried recently- congrats). Ms. Calhoun shared a few stories with me about her grandmother (who sounds like a real pistol). Her grandmother instantly fell in love with Sonoma on this trip. She was very concerned about the land being subsumed by the nearby urban sprawl, so she sought to protect it by developing the land into the winery that it is today. The winery has been owned and operated by the family for three generations. Ms. Calhoun explained, “My parents (Michael and Mary Deere Calhoun) have been running the vineyard since 1992.” Ms. Calhoun has been running their northeast sales for almost three years. In 1993, the family worked with world-renowned consulting oenologist Helen Turley and winemaker, Eric Stern. Under Eric’s direction, Landmark’s wines have garnered amazing reviews. In my opinion, these Chardonnays are underpriced for their value. In the early seventies, after moving to Sonoma County to study Political Science, it didn’t take long for the wine bug to strike Gary Farrell. He became fascinated with wine, learned from pioneers in the region, worked in local cellars and then started to make his own wine. “After working for more than 20 years in wineries owned and maintained by others, I realized a lifetime dream of moving into my own new winery just in time for harvest of 2000. With the experience I garnered from working and visiting other wineries, I dreamed of how I would set up my own facility.” The rest is history. 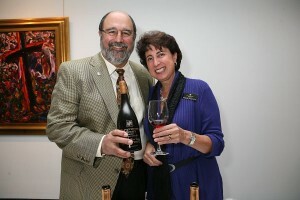 After spending 3 years working alongside Gary, Susan Reed was promoted to head winemaker in 2006. Susan arrived in Sonoma in 1981, working her way up from lab technician to head winemaker prior to working with Gary. 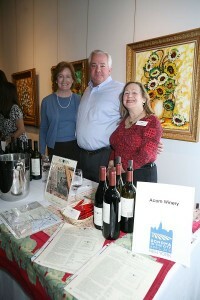 These wines are extremely elegant and were some of my favorite wines from this event. 2007 Russian River Selection Chardonnay, Russian River Valley– click here to purchase: $28, custard, baked apple, hazelnut, with some nutmeg. After I was done tasting (and spitting), this is the one of the ones I savored at the end of my day. I truly enjoyed this. The wonderful acidity balanced it all. Ben Papapietro, head winemaker, worked for the San Francisco Newspaper Agency, making wine as a hobby in his garage for 17 years. Ben met his future partner Bruce Perry through working at the agency. Bruce quickly joined Ben in making wines in his garage. Bruce’s wife Renae, a “New York girl with brains and chutzpah” added her marketing expertise to the mix. Ben’s wife, Yolanda, who used to be an insurance broker, now handles distributor relations. Together, the four of them own this endeavor. They set out to make wines that are, in Ben’s words “Authentic, not pretentious. Confident, but not too serious. Humble. The winery is an extension of my home and personal hospitality.” Papapietro Perry handcrafts their wines from 10 single vineyards in the Sonoma area (Pinot Noir and Zinfandel). Photos courtesy of Jennifer Mitchell Photography and www.sonomawine.com.